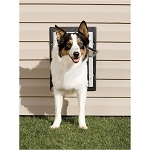 A wall mount pet door can be a great choice. 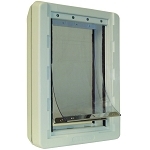 While installing a pet door in a door effectively ruins the door, a wall mount pet door can often be removed and the wall patched leaving no trace. Our wall mount dog doors can be installed in interior or exterior wall materials 4-3/4" to 7-1/4" thick, including siding, stucco, and even brick. 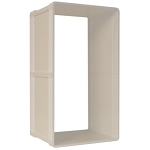 Place it anywhere you have a clear inside and outside wall area, from the garage, kitchen, mudroom, anywhere! Double flap construction with adjustable sill and extra strong magnets ensures excellent insulation factor. Durable aluminum frame. Includes a non-rusting locking closing panel.